After I finished my F. Scott Fitzgerald reading/blogging project in December, I cast around for ideas for my next series. I couldn't think of another author whose bibliography I wanted to work my way through - and nobody else suggested anyone - so I decided that this year I will re-read a bunch of my favourite novels and blog about them. In some cases, I might find I like the book less than I thought I did, or I might appreciate different things to what struck me the first time around, and those would be interesting (for me, at least) to think about. Re-reading is something I have a great theoretical appreciation for. I think that the sign of a good book is one that you want to return to, and that you like more, or in different ways, to how you did when you first read it. I also think that a lot of books - like a lot of movies and tv shows - actually improve the second time around. You can focus less on the Who-What-Where-When of the story and appreciate the telling more, notice details that you may have missed the first time around, and see how knowing the ending affects your reading (/viewing) of the beginning. Against that, however, I have a huge pile of books I've not read at all, ready access to many more, a mental list of many books or authors I'd like to read and an account with the Book Depository. So, in practice, I re-read much less than I would like to. The first book in my 2012 re-reading project is in fact one I've read multiple times in the past (about four or five times, I'd guess). I first read Vikram Seth's novel over a decade ago, when I was an undergrad, and I re-read it for the first time less than six months later - which fact is made more interesting because A Suitable Boy runs to 1474 pages in the paperback and took me about two weeks of solid reading to finish. 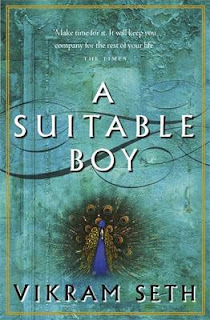 I don't really believe in allocating things as my all-time favourites, but A Suitable Boy is my standard answer when someone asks what my favourite book is. Yet I haven't actually read it for a few years, so earlier this year I felt a desire to read it again. A Suitable Boy, despite its daunting length, is a fairly straightforward novel. Its main character is Lata, a 19 year-old girl in 1951 India. Her older sister has just gotten married, and now her mother thinks it's time to find a suitable boy for her youngest child. But that's not it - A Suitable Boy has a huge cast of characters, and while Lata's story is the centre of the novel, almost as much time is spent with her new brother-in-law's brother, Maan, a warm-hearted but impulsive young man. There are also separate but related stories about other members of each of Lata & Maan's families and their various friends and associates. Along the way, A Suitable Boy touches on university politics, actual politics, literature and poetry, shoe manufacturing, families, rural life, religious tensions, cricket and India's national identity in the immediate post-colonial period. That wide range of stories and characters is what makes A Suitable Boy more than a simple Pride & Prejudice re-hash in a different context (fun though that could've been). Seth juggles all his elements perfectly, writing all his characters - even the unlikeable ones - which such warmth and empathy that we can spend consecutive chapters barely touching on Lata and her story without feeling like we're off the point. All the stories and scenes are connected to Lata & her family, or Maan & his, even if neither of them actually appear there and even if the story has nothing to do with the ultimate question of whom Lata will marry. As we move through this enormous book, meeting more & more characters (some central characters don't appear for the first time until 400 pages in! ), Lata's choice for a husband narrow down to three boys. Not everyone will be happy with her decision, but my most recent reading made me realise more clearly than ever before that it probably was the right one. Returning to A Suitable Boy after a few years was like returning to a world I now know well. Like the best long-running tv shows, A Suitable Boy's massive scope allows Seth to build an entire world and populate it with three-dimensional characters. Parts of the novel are set in Calcutta and other real-life cities, but the bulk of A Suitable Boy is set in the fictional town of Brahmpur, which by the end of the book you feel to be entirely real. Similarly, while some real-life Indian politicians appear, the fictional ones are so well-drawn that scenes between real and fictional characters seem completely plausible. This is the rare novel which can be both heart-breakingly tragic and laughter-inducing hilarious. We feel characters' joy, despair, indecision, anger, ambitions and friendship. The warmth of Seth's writing, the scope of his stories and the wonderful characters will keep me returning to A Suitable Boy. Ohhhhhh, I'm so jealous. This would have to be my all time favourite book too, but I have yet to find the time for a re-read (although I've already told my husband I wish to be buried with my copy!!) I've also heard that Seth is writing a sequel called A Suitable Girl due out this year - fingers crossed it's true. Oh yeah, I forgot to mention the sequel - although I think 2013 is the estimated publication date. I've also heard it might be called 'An Unsuitable Boy', so who knows...?